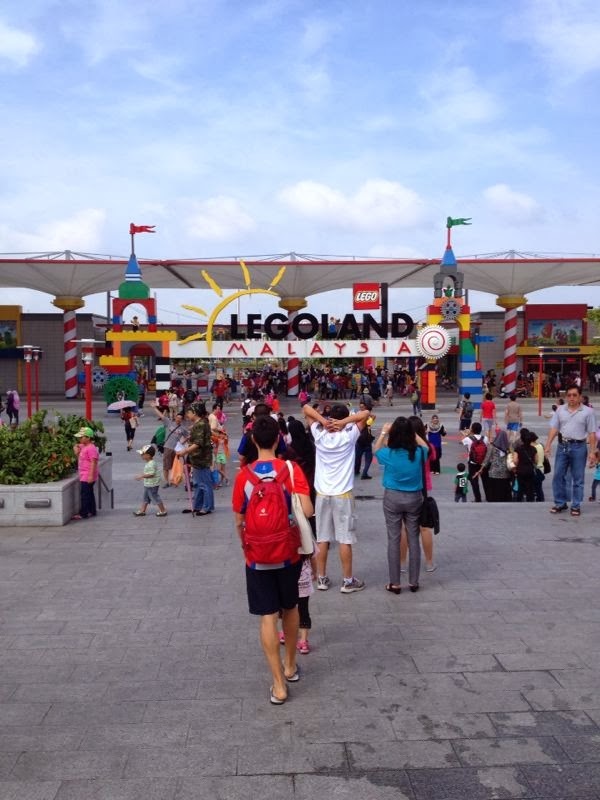 We had the benefit of a ride up to Legoland Malaysia to spend the day with some friends. We chose Friday to avoid the weekend crowd, and traffic to the Tuas checkpoint was smooth despite the peak hour. We cleared customs and arrived promptly at the opening time at 10 am. There was an unforeseen delay as our e-tickets took longer than expected to be processed (there was a mistake on the part of the agent we bought them from). Some grapes and tangerines we prepared for the outing kept us fueled as we waited. 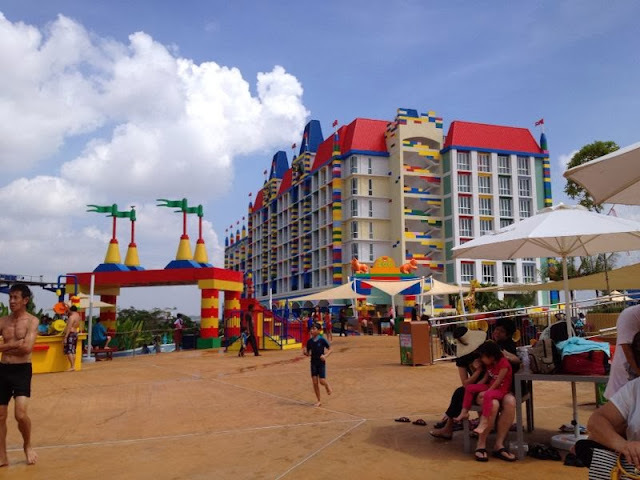 Legoland Hotel as seen from Waterpark. Hotel is located just at the entrance of Legoland entrance. Nevertheless, the helpful staff did all they could to assist us in getting into the park. 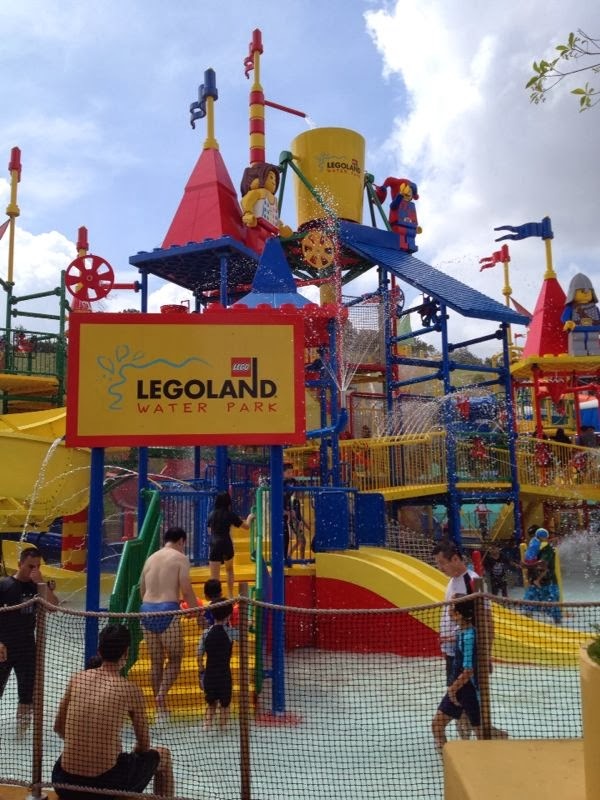 When we finally got our tickets, they advised us that weather forecasts predicted showers after lunch, and we followed their advice to head out into the Water Park first. The weather then was baking, and sunscreen was a necessity for the kids. 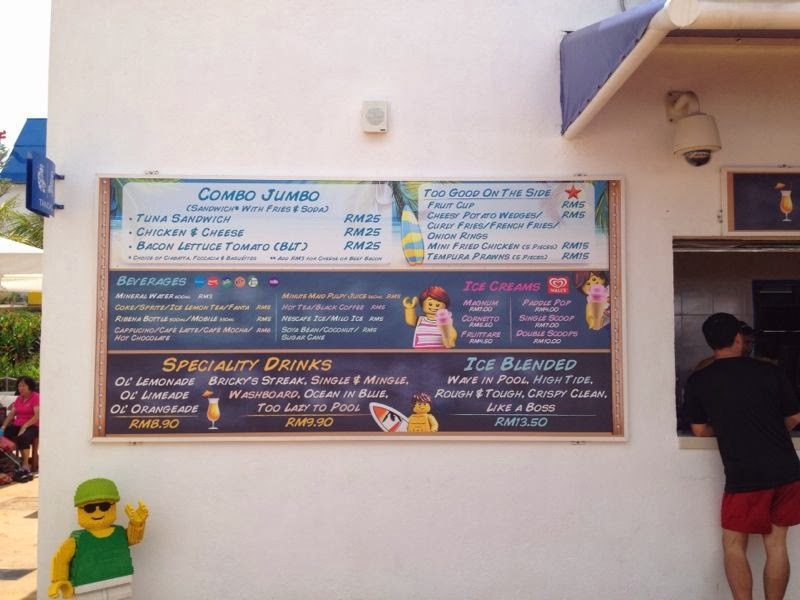 The selection of drinks and snacks at the Brick Bay Cafe where we settled down. 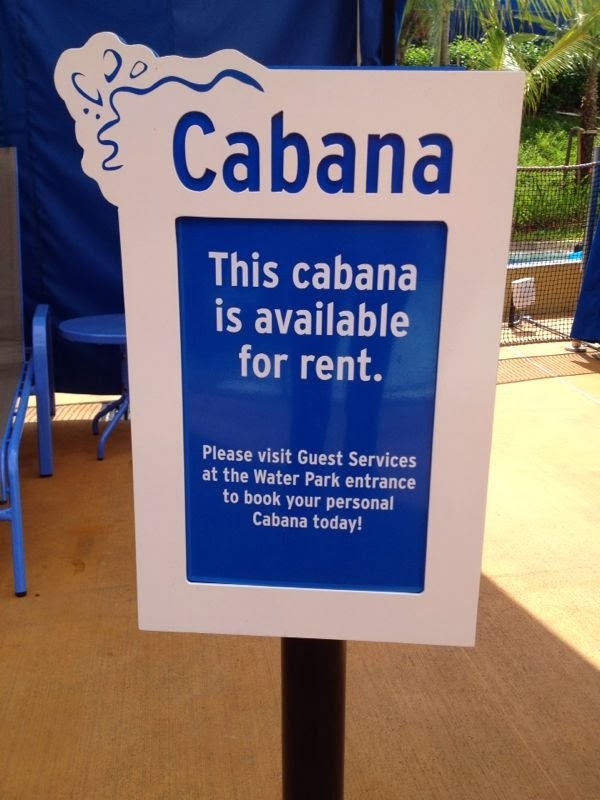 Tent-like cabana structures were available for rent. On a hot morning like this, a cabana complete with deck chairs, fan and safe box was tempting, but the price of RM300 made us think twice. After 2pm, the price is reduced to RM150. 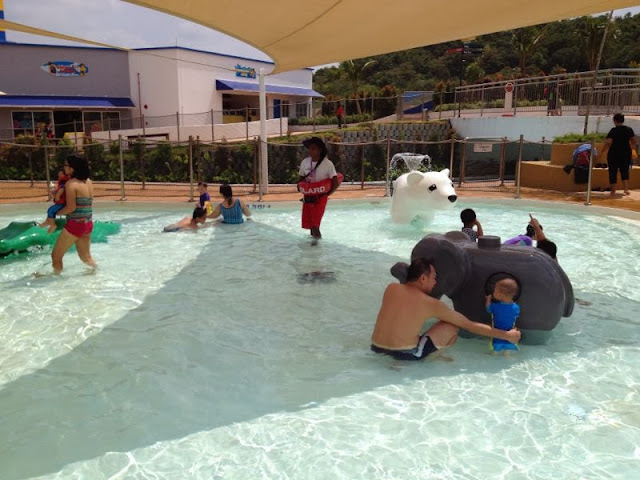 The Build-a-Raft is a looping river in which families can float lazily along with the current in rubber tubes. 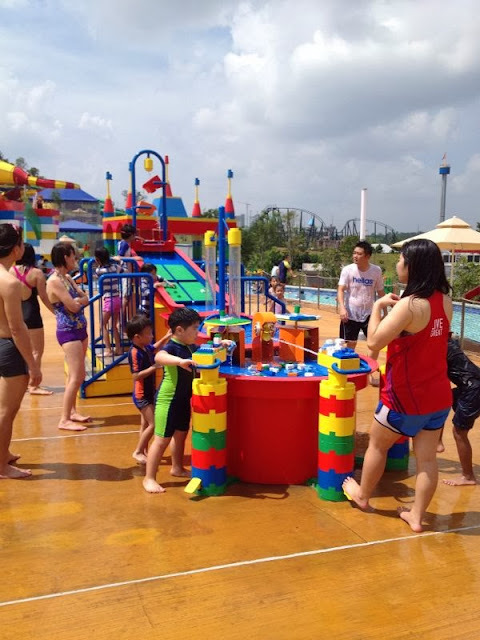 Floating in the river are over-sized LEGO bricks that can be used to build a floating raft. Although there are quite a number of rides, the Water Park is quite compact, and we were able to have a couple of adults establish a ‘command post’ in front of the Brick Bay Café while the older kids ran off with another two parents to enjoy. 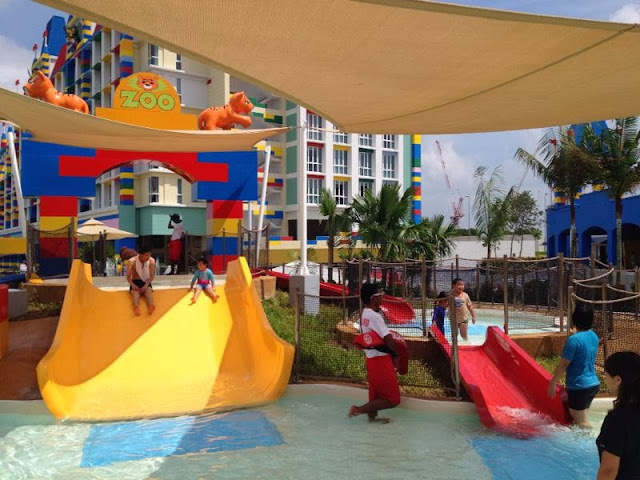 Daddy took care of K in the play areas suitable for younger children, the Joker Soaker, Duplo® Splash Safari, and various imagination stations here and there. 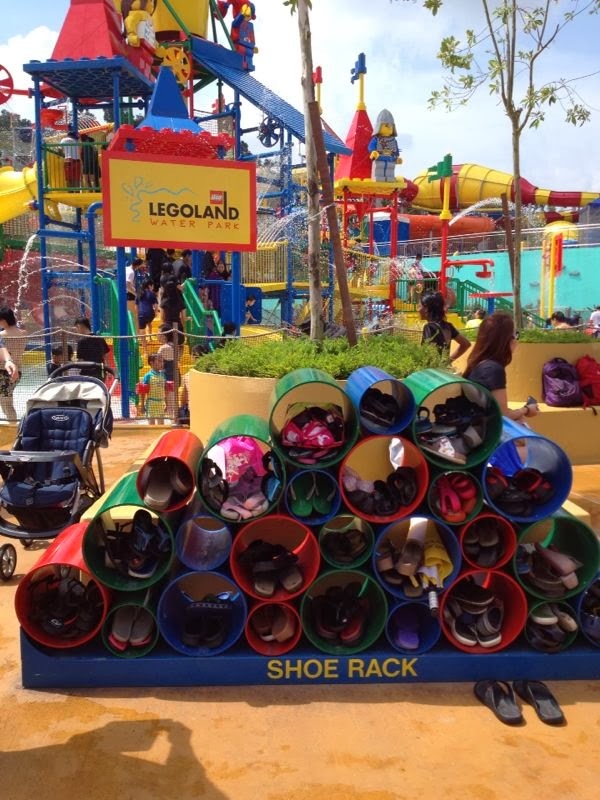 The Joker Soaker play area. 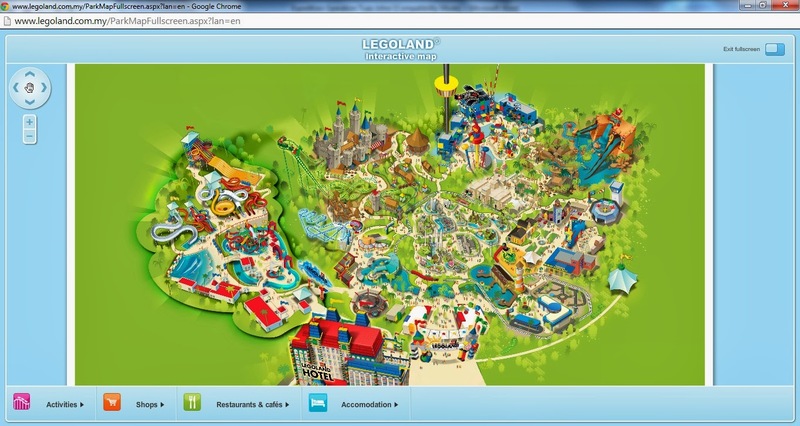 Duplo® Splash Safari. By turning a large steering wheel, the kids can control the volume of water sprayed out of this elephant's nose. 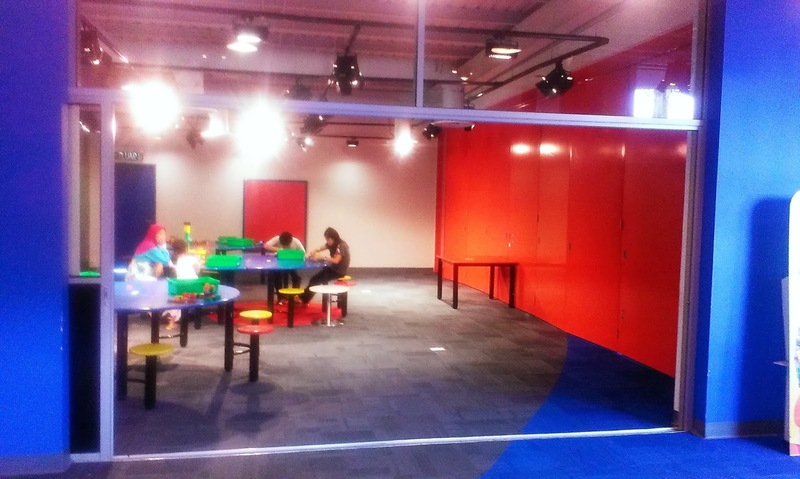 Imagination Stations are table top structures that encourage children to use their imagination to build objects using the bricks provided and engage in small-scale creative play. 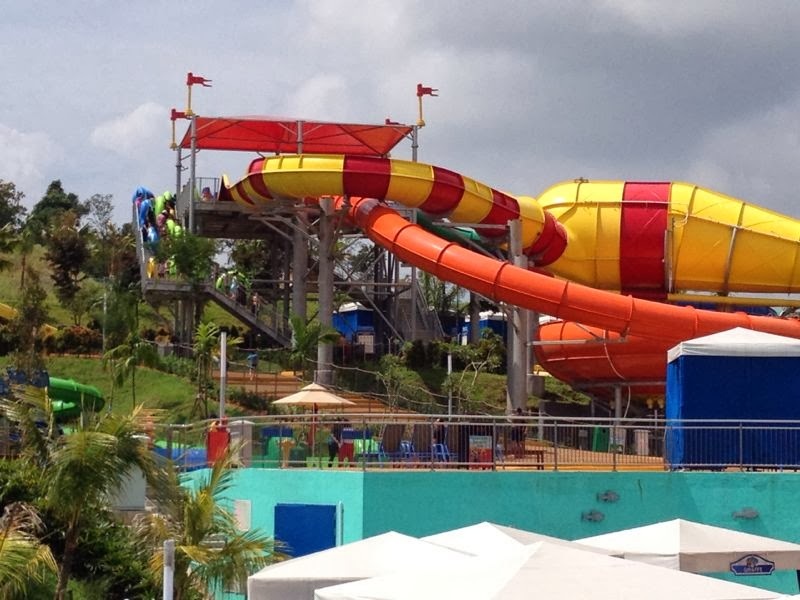 The 'entry-level' water slides at the Duplo Splash Safari. These gentle sloping slides were suitable for the very young, and parents were allowed to accompany their kids. Typical shoe rack to leave your shoes while you go queue for a ride. 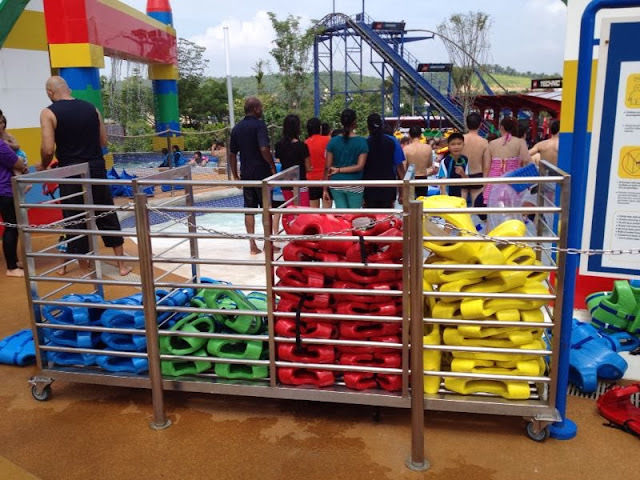 Life jackets were provided at certain attractions so everyone can get into the water safely. After about 2 hours slipping and sliding around with K, we decided to head out and get a shower and some food. The toilet facilities had electronically operated lockers which could be accessed unlimited number of times during our time there. The toilet facilities were well-maintained and had large family cubicles for parents to assist younger children showering together at the same time. Shower foam was provided, and we had brought along small, old towels that we intended to use and dispose after, lightening our load as the day progressed. One of the kids' favourites was the wave pool. They donned on life-jackets and bopped up and down over the waves. When we returned to our ‘command-post’, the older kids had not yet returned. It was about 2 pm and the sun was still scorching. 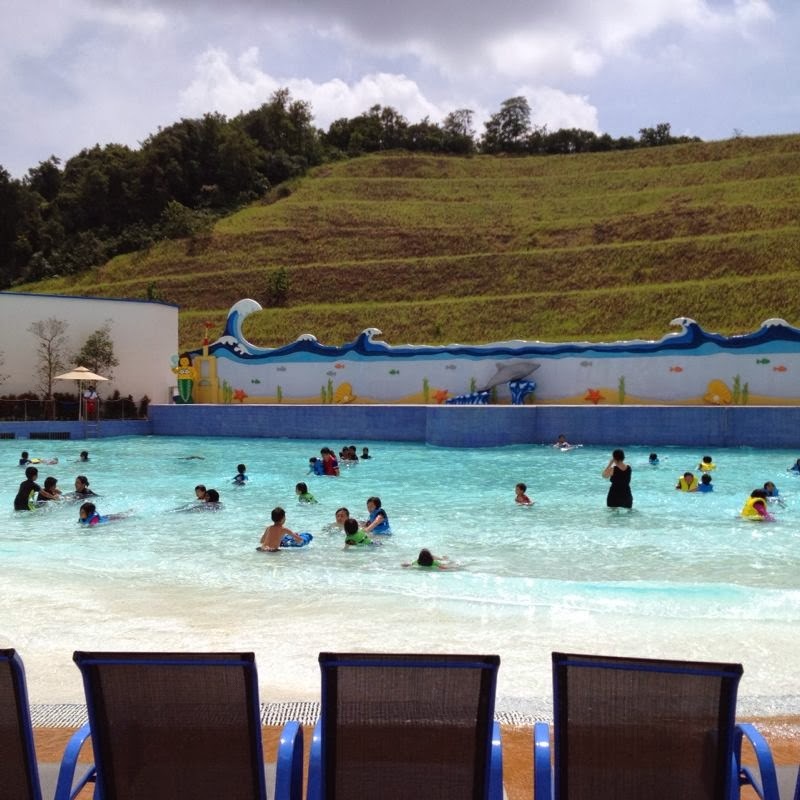 Mummy took K outside the Water Park where we had parked a stroller rented from the main entrance (RM30 for single and RM45 for double stroller per day). K was visibly tired after some snacks and dozed of quickly in the stroller. Daddy went out to look for the other contingent, and found them still high from trying every ride in the Water Park. Yes, let me repeat that again: every ride. I say this with pride and amazement, and A proved to us today that she has the fortitude and guts to match the adults. What was even more intriguing was the energy levels sustained through hours in the hot sun amidst this activity. Okay, part one was almost done, but how would we fare in the theme park after snacks? 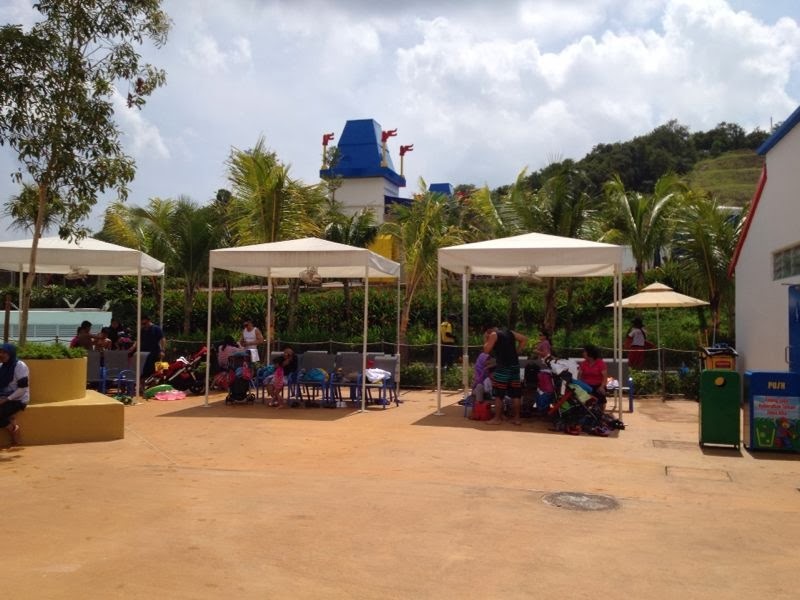 There was no time for lunch, at least in the mind of the thrill hungry primary-1 kids to be, and after a quick shower, buns, snacks and packet-drinks, we marched on, out of the Water Park and into the dry play section. 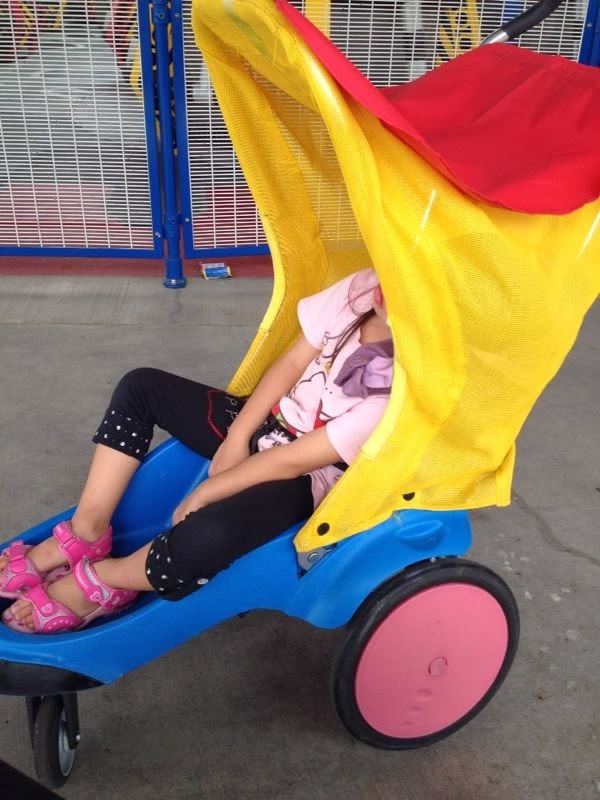 Asleep in the rented stroller. The ‘dry’ section didn't start out very dry as a torrent of rain splashed down on us just as the staff had predicted. 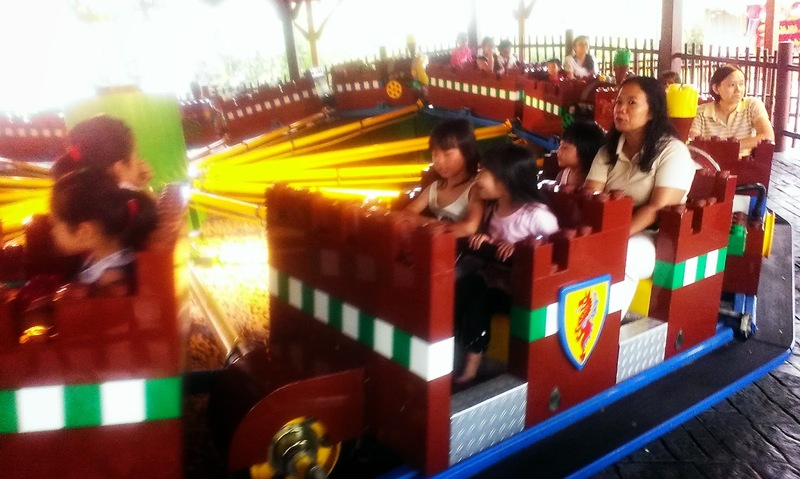 We linked up with Mummy and K under the shelter of the TECHNIC® Twisters. The queues were not long, and they went over and over again until the rain stopped. 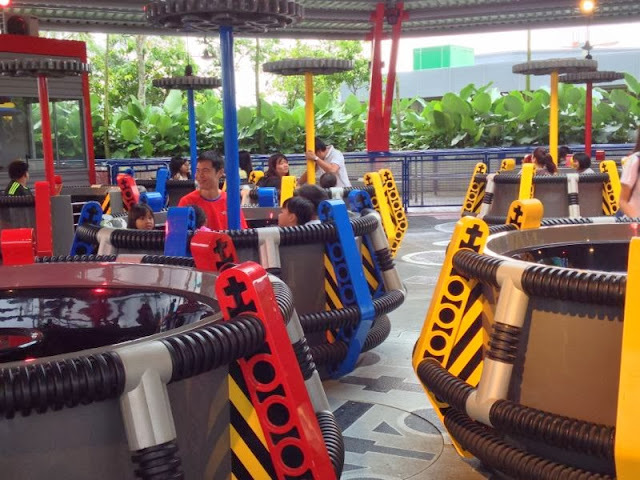 The TECHNIC Twister is Legoland's version of the teacup ride. 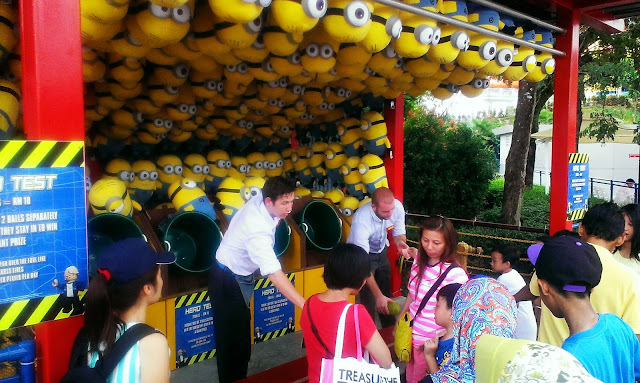 Game booth: toss all three balls into the pails and win a large minion! It turned out a lot harder than thought as the bouncy balls would not stay in the pail. Not far from there the roar of the Project-X caught the attention of the gang. Off they went to ride the 4-seater cars while the adults waited at the entrance and took up strategic positions to photograph their expressions during the steep drop. A steep drop on the Project-X and we're all screaming! Check out the priceless expressions on the slow-motion video! 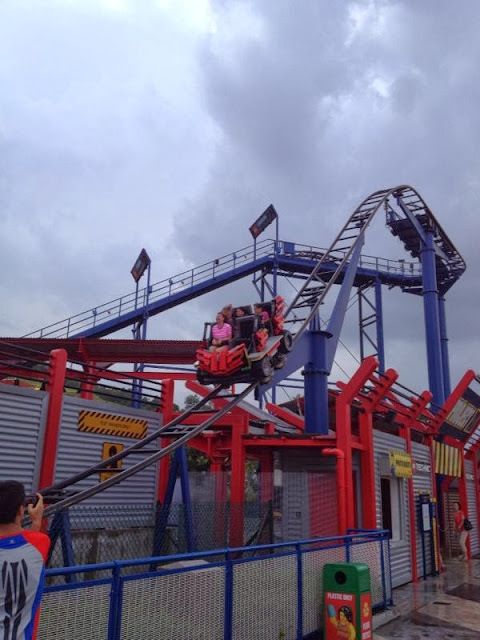 After about three times on the Project-X, we had to convince the kiddo-gang that there were other rides worth exploring that are just as thrilling. We moved on, peeking into the LEGO® Academy, an air-conditioned and spacious seminar-like setting with work stations and limitless supplies of bricks and parts. Massage chairs were in corner, and it seemed like a welcomed hide-out for tired parents to take a rest while keeping active kids occupied. Outside the academy is a huge Albert Einstein mural completely made of Lego blocks. Air-conditioned comfort. 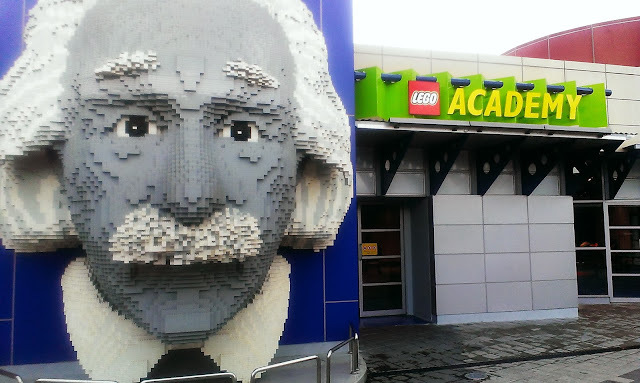 The academy is the perfect place to get out of the heat, occupy the kids, and get a rest. Although we were tired, our kids weren’t ready for an air-conditioned room. 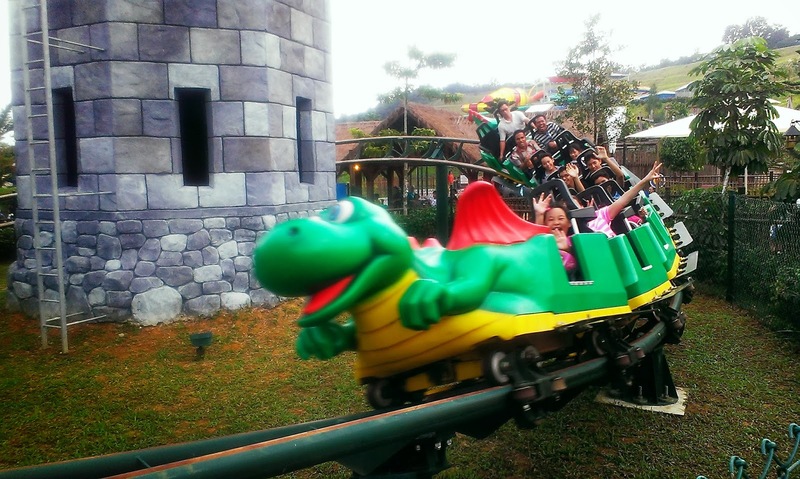 Instead, the Dragon’s Apprentice roller coaster was next on our list, and as expected, once hair raising spin was just not enough for these thrill-seekers. Three was about just right. The first drop on the roller coaster and the kids are loving it! Waving and smiling for the camera! 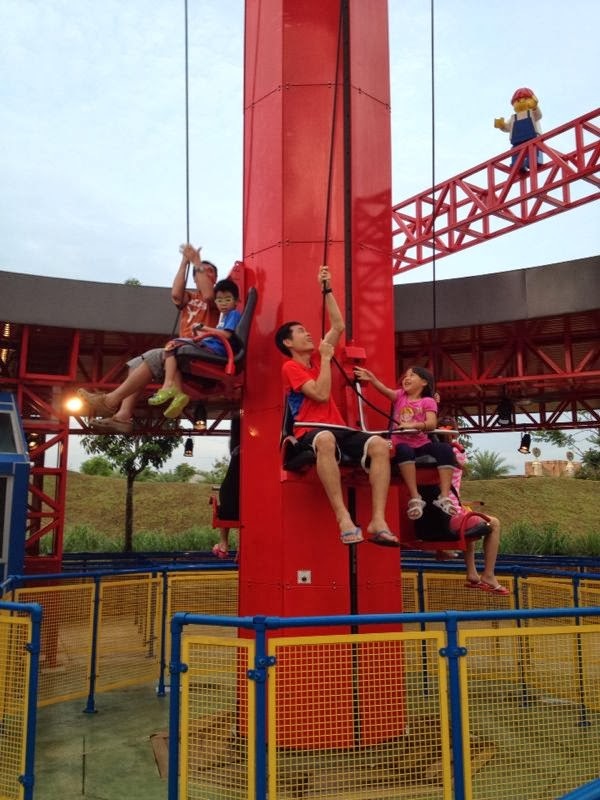 While the older kids had their rounds on the roller-coaster, Daddy took a couple of kids to try out milder rides. They found a mechanized pony ride called the Royal Joust where children sat belted to a rocking plastic horse as it made a lap around a track, exposing them to sights and sounds of a medieval jousting festival along the way. The ride was popular among children who were not yet ready to tackle the higher, faster elements. 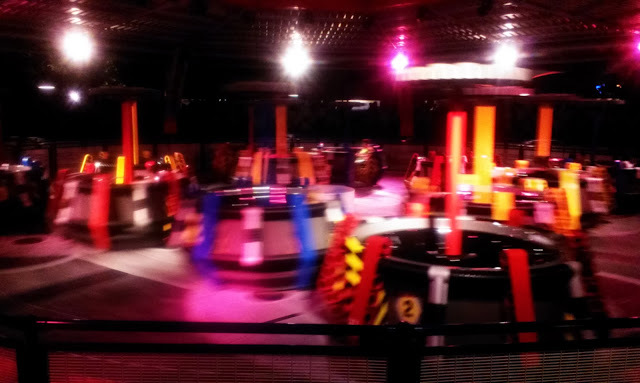 After two rounds of the Royal Joust, we returned to the roller-coaster to find that the other kids had left with a parent to try out the Junior Driving Academy near the entrance. The teenagers had returned from the ‘big roller-coaster’ called The Dragon and were now scouting a gift-shop at the Forestman’s Hideout. We decided that we will continue our stroll at a snail’s pace until we linked up with the other group. 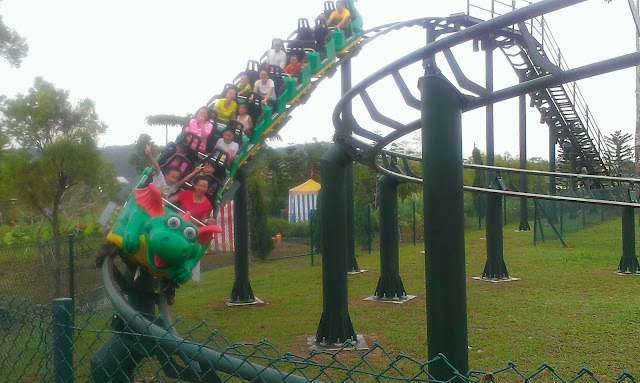 Merlin's Challenge: a mild ride to some, but do not be deceived. It does speed up quite a bit and the wave like motion is not something you want to experience after a heavy meal. It was starting to get late in the afternoon, and the adults were tired… let me stress: adults were tired. The kids? It looks like they just got started. We linked up with the eager bunch that split earlier, and they didn’t even need any food and drink since their snacks after the Water Park to keep them going! To make sure that the adults survived, we decided to strategize, pick and choose rides instead of going for everything. The Kids Power Tower looked interesting. 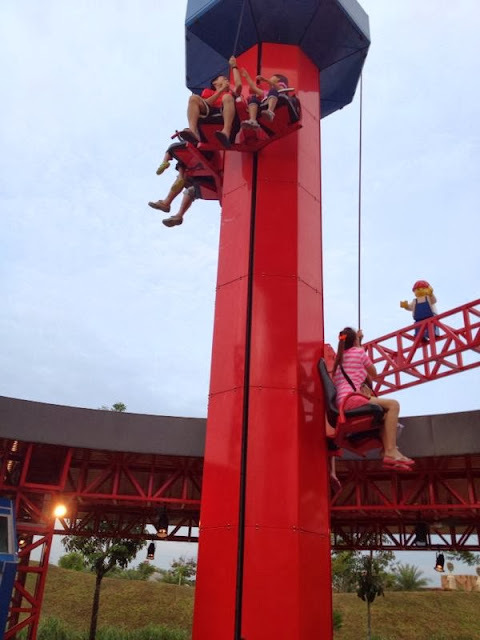 As a pair pulled on a rope, the chair they were sitting on rises all the way to the top. Letting go will start a slow descent back to the bottom. We went for a few rounds, and it became evident that while the kids were enjoying the ride and the view, the adults accompanying them were getting sore arms from all that pulling. The view from way up there was actually very nice. 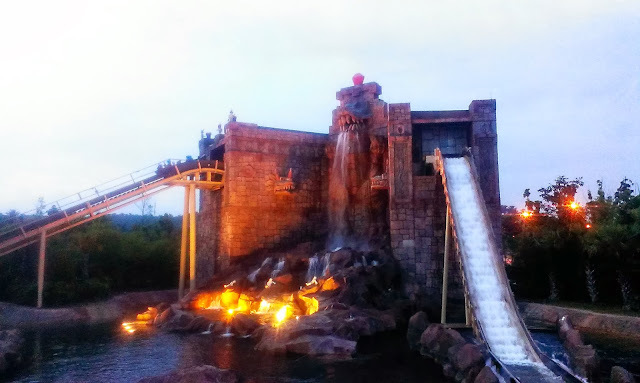 The next ride that caught our eye was Dino Island, a mechanized boat ride that takes you up into a dark ‘cave’ before dropping the boat down a steep water channel. 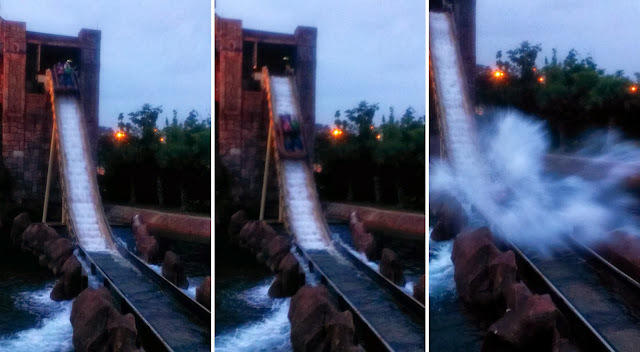 The splash is huge, and the kids donned ponchos before joining the queue. And yes, if you guessed they went about three times, you are right. Around that time, K decided that she wanted more goes at the TECHNIC® Twister near the entrance. It was getting dark and about 30 minutes left before the park closed at 8 pm. Daddy decided to go ahead with her to fit in a few more tries there before linking up with the rest at the exit. 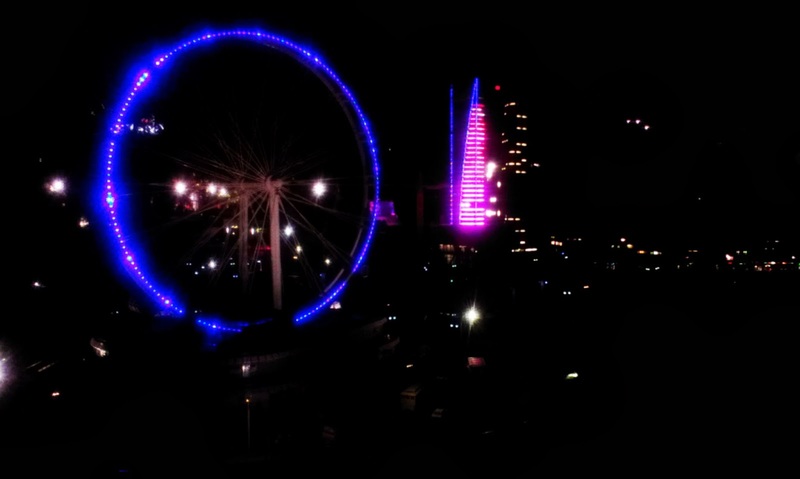 Along the way, we marvelled at the mini-land exhibits, photographing the Singapore city area display including miniature models of the Singapore Flyer and The Esplanade Theatres by the Bay. Pictures in the dark brought out the realistic lighting that you’d likely see driving over Sheares Bridge. Dino Island... note the barge entering the cave on the left. The splash was huge! Good thing the girls preempted this and had their ponchos on. 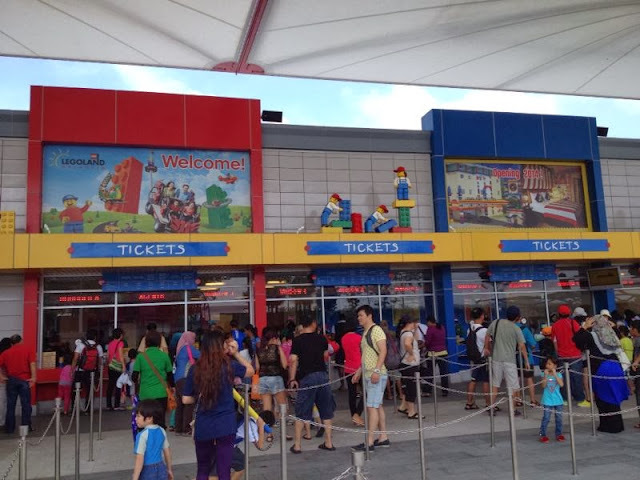 Miniland exhibit was made up of many stand alone displays of places of interests around the world. It was until I found the Singapore city that I appreciated the level of detail represented by this minature Lego model! We're back at the TECHNIC Twister! 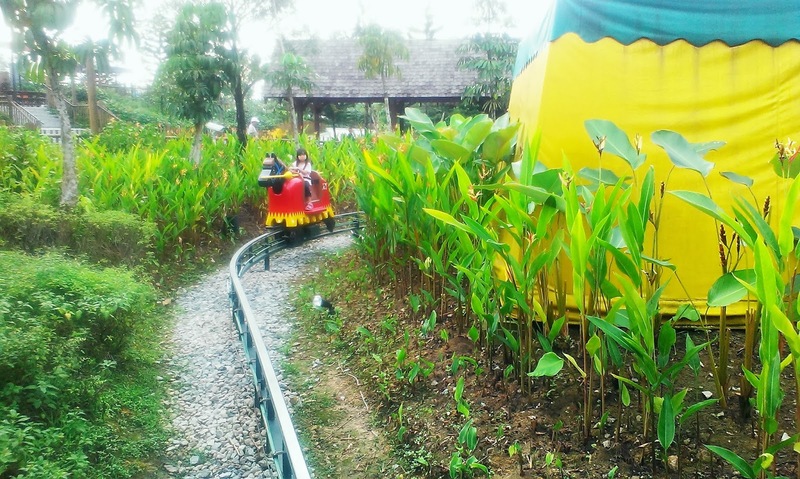 Daddy had drunk quite a bit of water before the ride and the spins on the TECHNIC® Twister were making him feel sick. Mummy had to take over as the young girl wasn’t done and only met the ‘with-adult-supervision’ height requirement and was not allowed to go solo. After about five tries, we headed to the exit, giddy. The shutters were coming down and most of the shops in the park were closing. When the rest arrived, we used the toilets one last time, left the park and settled down at the Burger King restaurant in the Mall of Medini. 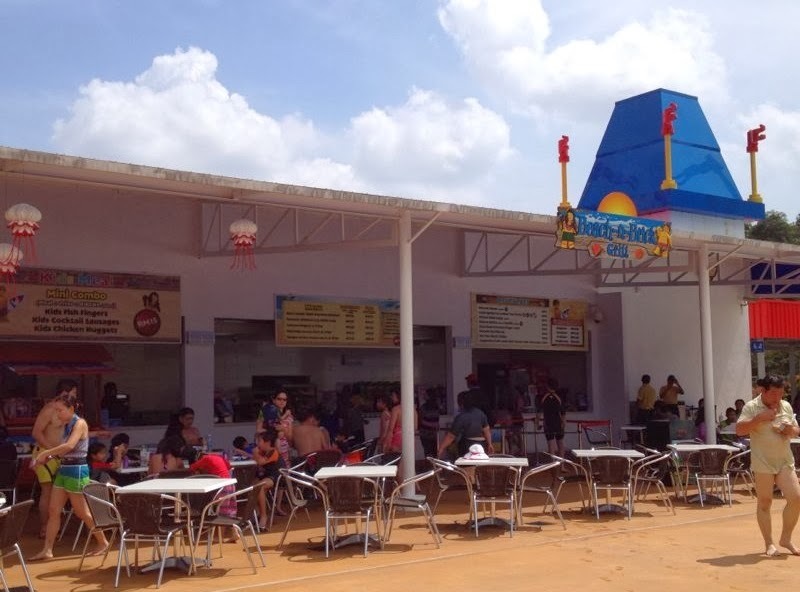 Most of the outlets were already closed, and some of them had run out of food! Even in Burger King, we had to change our orders several times because of the lack of food. The ride back home was slowed by the traffic at the Tuas Checkpoint. By the time we got home, it was midnight, and everyone in the vehicle (except the driver, thankfully) had fallen into slumber. We dragged ourselves out of the car. Getting ready for bed was a chore. What mode of transport did you use? Singapore to Legoland is accessible via shuttle bus, limo, taxi, and private vans. Should you choose the latter, you can hire our services and choose from several options of multi-seater MPVs. See JohorTransport.com for details. Standard Chartered Marathon Singapore: Kids Dash!